Last month I wrote up some thoughts on Into the Badlands season two up to episode four of this ten episode season. I wrote briefly about why I was watching the show to begin with, and what was bothering me about it. Now, with the season having come to an end, it’s time to check back in and see whether they made up for mistakes made earlier in the season or if it has continued its downward spiral. Let’s first explore the positive aspects. The show does have a very diverse cast and it features a mostly well choreographed over-the-top martial arts action style that remains the show’s highlight. It has even grown more bloody and violent as the season progressed. There’s a certain amount of political intrigue here, though not as much as I wish there were, but more often than not, rather than characters enacting clever schemes to upstage their competitors, the show tends to rely solely on its action. That wouldn’t be particularly problematic if it weren’t for the showrunner’s frequent decision to avoid killing off any of the show’s major characters. My hope is this season will just be looked back on as that one bad season where nothing made sense because they had to try to write their way out of the corner they'd previously written themselves into. The decisions made by these characters were completely inexplicable far too often. Season two revolves around a decision made off screen at the end of the last season. Sunny was all ready to whisk Veil - who was pregnant with his child - out of the badlands. They, along with MK, needed to escape Quinn - the man who murdered Veil’s parents - and the unstable political situation in the badlands. When Veil finds out that Sunny could have, but didn’t, stop Quinn from murdering her parents, she’s understandably angry with him. However, her decision not to leave the badlands with him is inexplicable when considering the alternative. Season one ended with Quinn being run through by Sunny’s sword and a violent showdown between Sunny and a group of powerful monks who captured MK for unknown reasons. We were unsure where the monks would take MK, and Sunny, still badly injured from his encounter with the monks, barely managed to make it out of the badlands. Veil on the other hand, having stood up Sunny, inexplicably locates Quinn and nurses him back to health - which is the extremely important event that I was referring to that happens off screen. Yet the show never bothers to take the time to question why she'd make such a silly mistake. Instead her action is just brushed off and used solely for the sake of an ill advised surprise reveal in the first episode of season two. Let me just reiterate, Veil hates Quinn because he’s clearly an evil and dangerous man who killed her parents. She even refused to go with Sunny to escape the badlands simply because of his inaction when Quinn murdered her parents. Yet somehow, inexplicably, she chose to nurse him back to health from a wound that would likely have been incurable anyway. And of course, this decision altered the course of the entire season. Almost every line of action started in season one is put on hold in order to deal with Quinn. Quinn rebuilds his army of followers. The Widow's plan to take out the other barons is complicated when Quinn shows up. Quinn also holds Veil captive with the intention of marrying her and taking Sunny’s child for his own against her will. 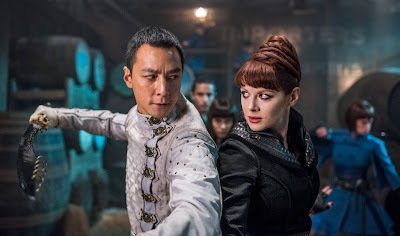 Sunny is forced to find a way back into the badlands shortly after having finally succeeded in escaping because Quinn is now holding Veil and their child. MK's dark power is tested at the monk's convent before being discarded after he learns a terrible secret - which ultimately discards one of the more promising elements from the first season. 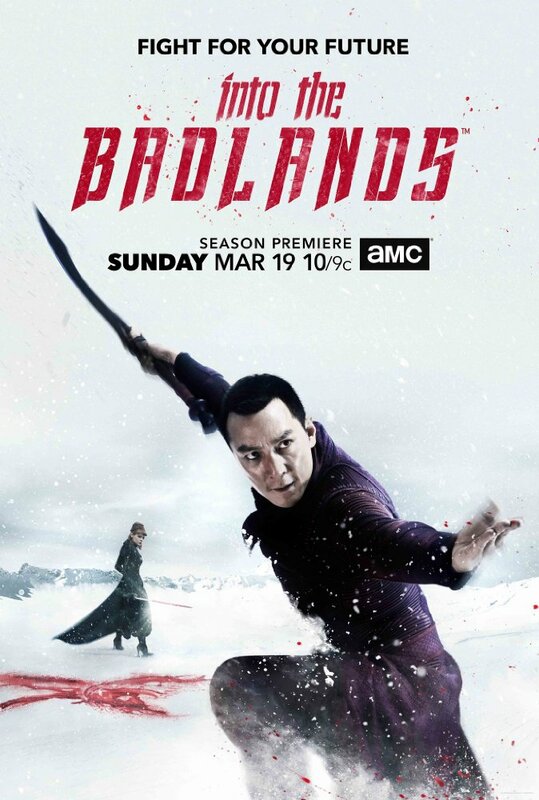 MK also tries to help Sunny which forces him back into the badlands as well. 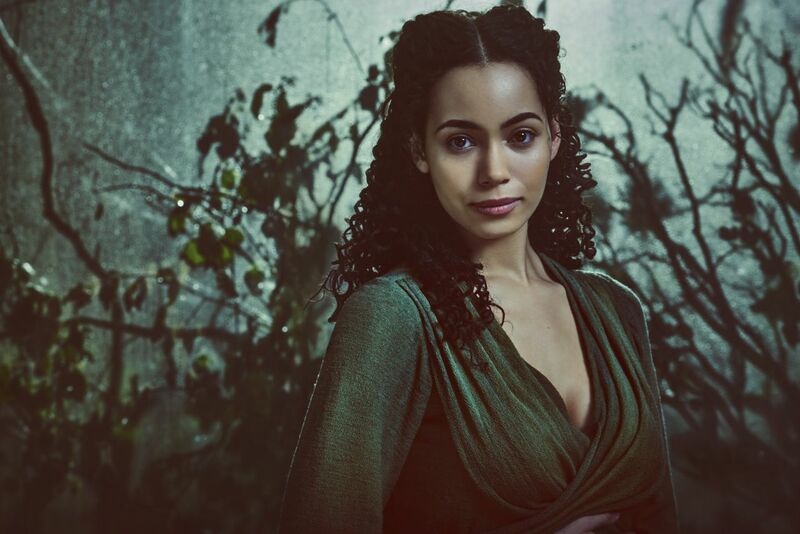 And because of all the stuff going on with Quinn, the search for the mysterious city of Azra is put completely on hold throughout the season. After my post about episode four, things got mildly better - with brief moments of more bad writing here and there spread throughout - but by the finale things have gone fully off the rails again. It involves Sunny breaking into Quinn’s underground camp - that had supposedly been rigged with enough explosives to demolish it, killing everyone inside. Sunny’s attack is cut short almost immediately when Quinn sets off one explosive that buries him in rubble. However Quinn and company leave him without checking to see whether or not he survived. Which, of course, means Bajie can come along at just the right time to help Sunny get out of the rubble only to see a squad of Quinn’s men round the corner as if they’ve been standing there waiting for him to emerge. Later, Quinn sets off all of his explosives thinking it’ll give him an edge in this situation, but the blast does basically nothing. Despite one character spending the entire length of the episode worrying about the amount of explosives hidden in this bunker, they don’t end up killing or even injuring anyone. Sunny’s assault culminates in a showdown between he and Quinn in which Sunny throws a sword through Quinn’s chest, yet Quinn fights back as though nothing happened only for Sunny to, again, run the length of his giant sword through Quinn’s chest, only for Quinn to, again, inexplicably stand up and act as though he were going to live through everything. It takes Veil sacrificing herself in order to put an end to Quinn’s life (supposedly). 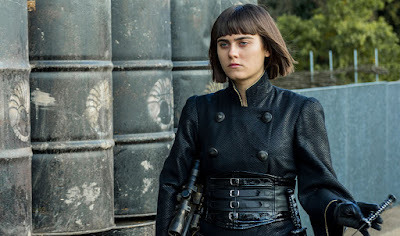 More importantly than Quinn's inexplicable ability to survive a ridiculous amount mortal wounds, Veil’s death has been the subject of much angst for many viewers. For one, she’s one of the few black characters on the show, and she was tortured physically and psychologically all season only to force her to kill herself in order to be free of Quinn. That point is made worse when we notice how hesitant the showrunners had been, up to this point, to kill off any of the central characters. More specifically, the show’s treatment of Veil is in stark contrast to the way the show has treated its white females. Quinn exiled, rather than killing, his wife after she betrayed him. Quinn did kill his son - one of the weaker, less interesting characters on the show. However he exiled, rather than killing, his son’s wife for her role in his son’s betrayal. Quinn inexplicably took his now ex-wife back in (after exiling her) despite the fact that she showed up to try to kill him - and inexplicably she never makes a second attempt to kill him despite being in the belly of the beast. Quinn letting these women survive not only makes no sense, it's a sign of weakness in a character we're supposed to fear. But even Tilda survives season two despite her growing dissent with the Widow and her methods. Their violent fight toward the end of the season left her badly injured, but still alive. Nevertheless, Veil has now been killed off with the clear narrative function of giving the show’s main hero a broken past with which to pull motivation from. Killing off a parent or loved one is a long running cliche in hero storytelling that is rightly becoming increasingly criticized. Then there’s Bajie (Nick Frost), a character I like despite how little sense he makes. He begins as the quirky comic relief character who is eventually given a more dramatic past. Yet his introduction, partnering with Sunny to escape a bad situation, shows him to be a man whose best weapon is his words. He’s otherwise shown to be a bumbling non-fighter. Yet later it’s revealed that he was a former member of the convent MK ends up at, and that he’s an excellent fighter who gave up the dark gift and left under peculiar circumstances. Nick Frost, for his part, elevates the often stilted material with his charisma and comic timing, but he doesn’t always sell the martial arts aspects. Yet the most frustrating aspect of the character is the way the show can’t seem to make up their mind about whether or not he’s a good guy who truly cares about Sunny and MK or if he’s just using them to get to Azra. I'm not opposed to that remaining a mysterious element about the character, but it's one more frustrating thing piled on top of an already overwhelmingly frustrating season. During a fight in the finale Bajie is stabbed in the side by a small pair of scissors and it’s clear the showrunners want us to fear for his life. Yet considering how many times Quinn survived being stabbed through the chest by a giant sword and the way they’ve avoided killing off so many other characters, I think there’s no reason to worry about him. It should come as no surprise that this show has been met with a very mixed reception. The writing and many of the performances (outside of a few of the core cast members) has left a lot to be desired. That's a shame when we consider the action, as over-the-top and sometimes stilted as it is, is some of the best on TV. AMC has, nevertheless, renewed the show for a third season (with plans for sixteen episodes), but considering how badly they've squandered the potential here, I don't think I have it in me to return for another season.